As most of you know, I was lucky enough to spend three weeks traveling in January. Although it hasn't been quite a month since I left for this adventure, as I look back at my photos and journal it certainly feels like it's been longer just because of the number of things I saw and did during that time. This was my first time traveling by myself, which means I was entirely in charge of the planning and organizing of everything for this trip. I guess the first thing I learned about traveling by myself is that it makes me much more organized. Overall I felt really prepared for this trip--by the time I left school on my last Friday before my trip I had everything booked, printed, and my bag was packed. My flight left on January 12th, but I actually went up to Seoul on January 11th to say goodbye to one of my Korean friends who was about to leave to study French in France for the year. It was a bit of a bittersweet start to the trip because I met Ji Young early in time time in Korea, which means by this point we've collected quite a few memories together over the past year and a half. As I said bye to her I couldn't help think "man, there goes another one." Out of all the people I used to hang out in Seoul with, Ji Young was the last one from our "group" that was still here. Of course, it wasn't really goodbye--she is one of the people I really do believe that I will see again. Nonetheless, it was a good reminder of how quickly time goes by, which was a good boost of motivation to see as much as possible while I'm still in Asia. 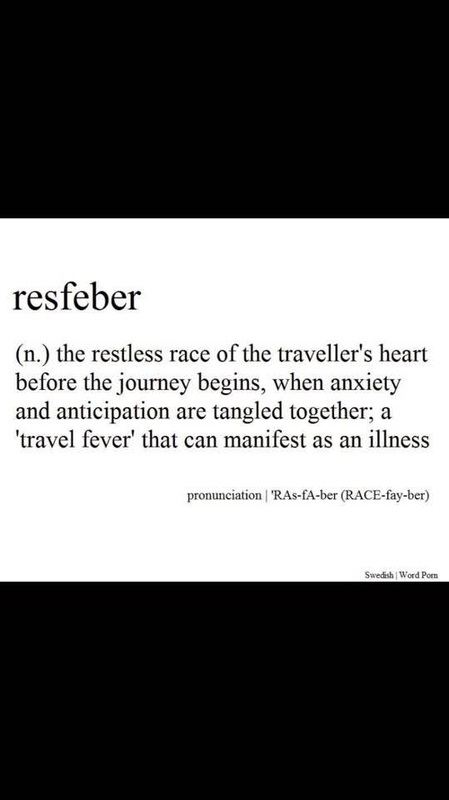 I don't think there's a better way to describe how I feel before I travel. I never sleep well the night before I fly because 1) I'm afraid I'll oversleep and miss my flight 2) I really, really hate flying 3) I don't know what to expect of these places I've never been and 4) Excitement...because even though it's kind of terrifying that so much is unknown, it's also exhilarating. Before I fly I actually quite often feel nauseous due to my anxiety, but luckily I wasn't SO bad this time, but I was mostly thinking about how I wanted to SLEEP once I got on the plane. Nonetheless, I got on my flight, which was scheduled to leave around 1:00, but we ended up getting a little delayed. I didn't think it would be a problem because I was scheduled for a two hour layover in Vinetiane. And while it shouldn't have been a problem, our flight landed about an hour later than it was scheduled for, even though we only left about fifteen minutes late. Again, this would have been ok, but I knew once I landed I needed to apply for my visa, go through customs, check into my next flight, and go through security again. Needless to say, by the time we landed I was staring at my watch and ready to speed walk my way through any lines. I rushed off the plane and luckily I found the smallest airport I've ever been to. I filled out my visa form and was almost immediately given my visa (I'm pretty sure they didn't even look at what I wrote at all) I was through customs in a breeze and walked over to the check-in area for domestic flights. This is pretty much when I knew I wasn't in Korea anymore. There were only a few small counters and when I went through security there was only one metal detector and the guy who was supposed to be watching it was quite literally picking his nose. When it came time to get my ticket checked there was no scanner, but just a list that my name was crossed off of. There was only one room that everyone waited in, and when it was time to board there was no intercom--they just yelled and announced our flight. I made it pretty much just in time to board my flight, which was fortunately a very short one. 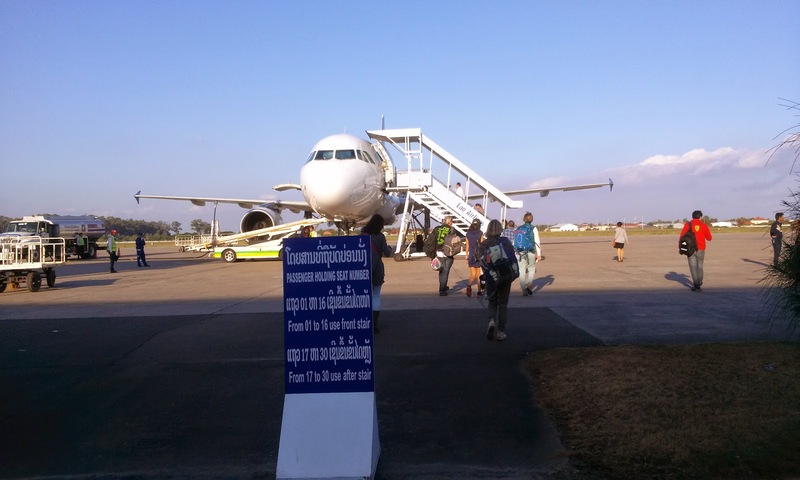 Technically I could have saved some money by taking a bus from Vientiane (the capital of Laos) to Luang Prabang, but that would have been about a 7-8 hour bus ride, and I just didn't want to spend that kind of time on a bus during my short vacation. The flight to Luang Prabang was only about 30 minutes, and I spent pretty much the entire time with my eyes glued to the window. 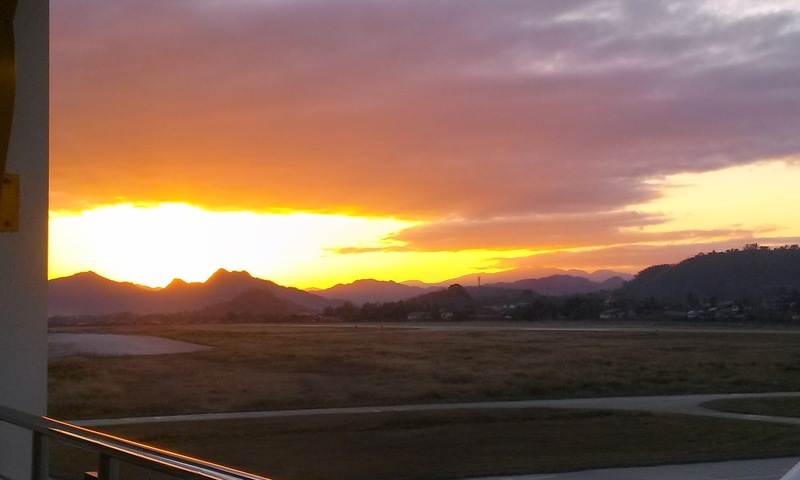 Laos is an incredibly mountainous country, and I was flying over the amazing landscape just as the sun was setting. 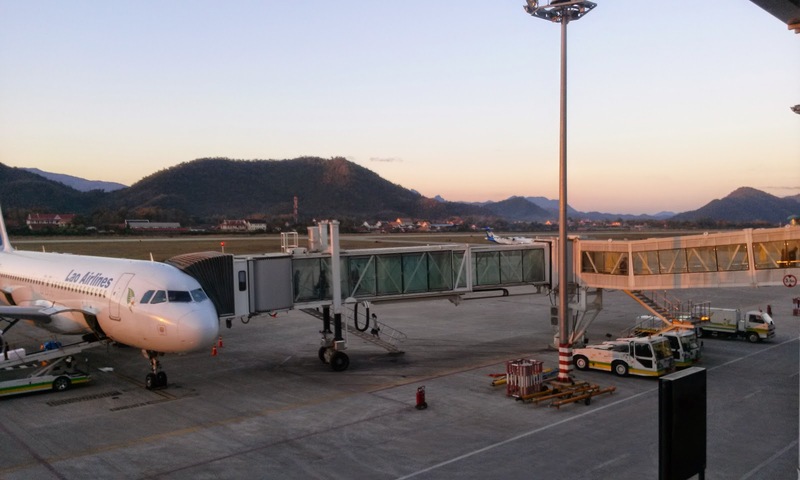 Once we landed, I walked off the plane into the refreshing rush of warm air, which is always a rejuvenating feeling when you're in the middle of a Korean winter. 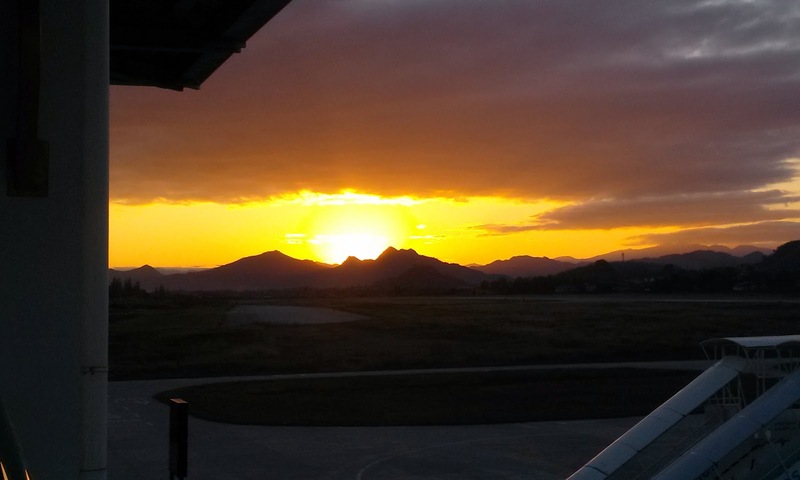 I was also greeted by one phenomenal sunset. 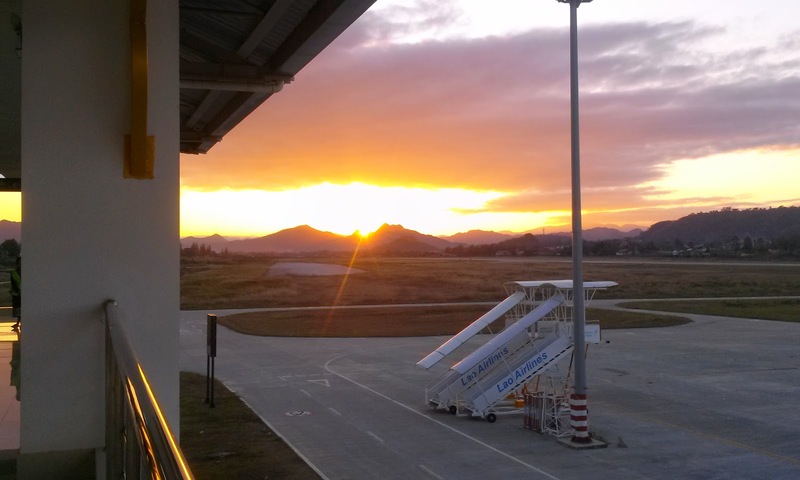 Laos certainly knows how to make a good first impression. Once I made my way to the arrival hall, I exchanged my money and got a cab to take me to my hostel. Driving around and seeing the tuk-tuks everywhere I felt my anxiety diminish as I realized I was really back in SE Asia. Once I got to my hostel I checked in and immediately realized it definitely wasn't as nice as I had been hoping for (or expected due to its good reviews online), but I knew I had to deal with it for at least a night. I met my three roommates--a girl from CA, a girl from Europe (I don't remember which country because she left the next day and I never really got to talk to her), and a guy from Brazil. After introducing ourselves and having some small talk I was asleep early that night--between the sleepless night beforehand and the stress/anxiety of flying, I was done for, but looking forward to getting out and exploring the next day.